Once again this year, our Club members participated in the Museum of Fine Arts pioneering Community Arts Initiative. The program partners with ten community organizations across the City of Boston – including Boys & Girls Clubs of Boston – to introduce youth aged 6 through 12 years to the Museum’s collections and the art-making process, while also helping them understand how art can be important in their lives. It aims to broaden a child’s experience of the world beyond their neighborhood, promote critical thinking skills, provide positive role models and exposure to career options, foster family engagement, provide a safe and nurturing environment in which children can explore creative expression, and give children the foundation to become well-rounded, inquisitive citizens. Features include programming at our Clubs carried out by the MFA’s Community Arts Liaisons, and the Artist Project, a collaboration between youth and a teaching artist that culminates in an art exhibition at the Museum. This year the members explored light and color. With sketchbooks in hand to record ideas and drawings, members discussed objects in the MFA’s galleries that use light as a medium or as a subject—including stained glass, contemporary light art, and Impressionist painting—to develop an understanding of the use of light in art and architecture. 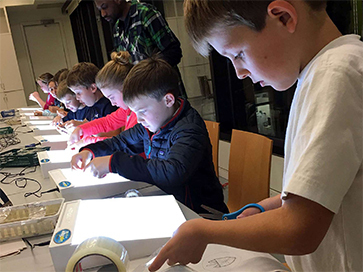 Then, inspired by what they explored in the Museum galleries and the buildings in their home communities, Club members used a variety of transparent materials to experiment with how they intensify and modify light. The final installation of “Building with Light” celebrates their discoveries, incorporating colors, patterns, and motifs from their sketches into designs on large Plexiglas panels. Click here to learn more about the Community Arts Initiative and watch a video featuring our members and their creations.